HTC sapphire viewport creates excellent optical quality. The average transmission of UV can reach up to 80%. The sapphire viewport is made by proprietary vacuum brazing and welding techniques. The sapphire viewport applicable vacuum range is up to 10-10 Torr and temperature range is from -100ºC~450ºC. The sapphire viewport doesn’t contain any magnetic permeability material, like Kovar steel, and won’t distort the magnetic field. The sapphire view port is applicable not only in general industry like heat treatment and vacuum coating, but also suitable in hi-tech industries, like semiconductor, optical, hi-energy physical research, ultra-high vacuum equipment, and optical or thermal monitor. Vacuum quartz viewports are components for viewing or optically sensing samples or process devices in a vacuum chamber or system. Window materials for vacuum viewports and access doors include optical grade glass, quartz, and sapphire. The important factor for making choice include optical application, seal type, connector fitting specification, bake or operating temperature and pressure range et..
Htc vacuum viewport has higher abrasion resistance, transparency to ultraviolet radiation well and low coefficient of thermal expansion which makes them very resistant to thermal shock. Htc viewports are offered with CF type, ISO type and KF Flange and Customized Flange. 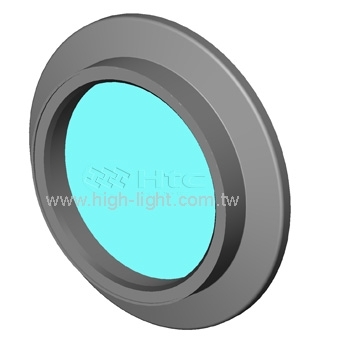 Htc viewport window surfaces offer a minimum of distortion , resistant to thermal shockand provide maximum ultraviolet transmission for most applications.